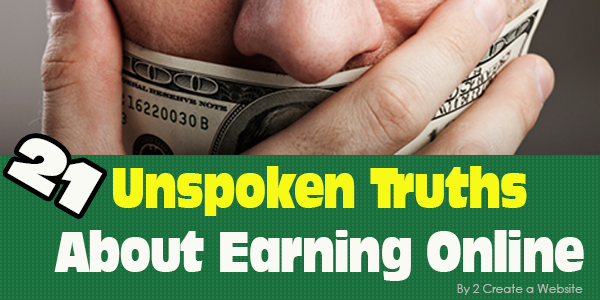 21 Truths About Making Money Online People Never Reveal But Should! Sure, there are guidelines and principles you can follow, but everyone has to find their own way and no journey is exactly the same. Find the avenue that caters to YOUR strengths and aim to be helpful. If you’re a good speaker, start a podcast. If you like to write, start a blog. Also, TIMING plays a major role. When someone is one of the first to successfully implement a site concept, it’s harder for others to duplicate it because they’ve captured that market. So don’t try to copy what someone started 10 years ago. Work on developing YOUR individual angle and use your personality and uniqueness to set your site apart. This is where so many go wrong. I discuss this in greater detail on a very personal podcast I published here. I can provide a road map or a course that will point you in a general direction, but you ultimately have to find your own way there. And it starts with you carving out your own approach and defining a market that NEEDS your information and perspective. And expect bumps and detours along the way. It’s all part of the process. Every Internet Marketing blog preaches about the importance of writing quality content. I know, I know. I’m guilty of repeating this phrase a lot myself. But what does quality content really mean? Your content is probably very helpful, but the Web has evolved and it’s flooded with so much information now. A lot of what was considered quality content in 2007 is now mediocre at best in today because of redundancy and our internal bar for quality Web content has been raised. Use video to publish more creative content. I love creating screencasts with draw tablets like this and using Powtoon to create fast-moving, animated presentations. These kinds of videos have a MUCH better audience retention rate than my talking-head videos. Create thought-provoking articles that challenge your perspective the way Mark Schaefer always does on his blog. Develop incredibly in-depth, how-to information like Ana Hoffman that goes above and beyond your average how-to article. Get more eyeballs on your social media content using fun, eye-catching images the way Rebekah Radice does often. Write revealing posts backed by mounds of research and proof like Glen of Viper Chill. Glen doesn’t just make claims, he always backs up his content with evidence — making many of his posts super juicy! He doesn’t blog a lot, but when he does, people pay attention! Use the storytelling technique to draw people in. There are some great tips on how to do that here. The point is that the Web has evolved, so we all have to work harder at producing content that is more interesting. It’s an on-going challenge for everyone. As a matter of fact, I’m going to make a conscious effort to stop saying “write quality content” without showing concrete examples like the links above. The phrase is overused and very subjective. Maybe I should start using “engaging content” instead because it implies creating content that will elicit a response. 3) You Can’t Tell Everyone What You’re Up To! I guarantee you have some naysayers in your life who are overly skeptical and don’t believe anyone makes money online. A lot of these people have no point of reference, meaning they don’t know of anyone who is successful. So they assume it doesn’t work. You have to learn who you can tell and who you can’t. Do yourself a favor and keep your plans quiet around certain people because they can be awfully discouraging. I hear people say all the time that they can’t do this because they aren’t good with computers or social media, building websites, writing, you name it! This is the Internet — where anything you want to learn is literally a Google search away. All it takes is a bit of desire, hard work and resourcefulness on your part. You want to be a better writer? Take a trip over to Copyblogger.com, become a member and digest every word. You want to become a pro with WordPress? Check out WPBeginner. Not all that great with social media? Get coached by Mari Smith and subscribe to sites that offer free advice like Social Media Examiner, The Social Media Hat and more. I totally get that this can be overwhelming at first, but you can learn. Remember, everyone starts out with little or no knowledge, but the great news is the information is out here if you want it. There are people who will swear that the need for money was the sole motivation before they ultimately found success. That may be true, but I guarantee they discovered something else they love about this process along the way. You may think the motivation to make money is all you need, but it won’t take you long to realize you need a second motivator. If this was ONLY about the money for me, I would have quit 13 years ago when the first dot com crash hit in 2001 and my site earnings dropped by more than 70%. Given that setback, I never once thought of quitting. I have an extreme passion for teaching, I love computers, making videos and writing. That is what drives me. 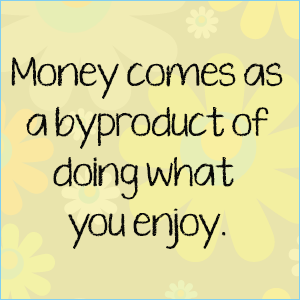 The money is a wonderful byproduct of this enjoyment. When you find that one thing that keeps you going when things are slow or get tough, it’s a nice motivator as you go along. Search engine optimization (SEO) plugins are great for ensuring you’re using the right markup, and they can help you learn what the engines look for. But installing one isn’t going to skyrocket your traffic. Discover why I disabled mine on this site. If you want Google to rank your site well, the best way is to prove that people like your site by earning natural backlinks and having a strong social media presence. Read more about ranking your site in Google here. No doubt we all love free stuff, and some free things are extremely valuable and useful. Even though I absolutely love Photoshop, I totally understand why people choose GIMP or Canva over such an expensive program — especially if these tools get the job done. However, I don’t get why people build their business sites on free platforms. If you want people to take your site seriously and you want full control, you’ve got to own your piece of real estate on the web. If money is the issue, everyone understands that, but save up until you can afford hosting for a couple of years and then start your site. You’ll prevent the headache of moving your site later. Ironically, choosing free can cost you more time and money in the long run. People often sell themselves short because they underestimate their own knowledge. You don’t have to know everything about a certain subject to build a successful site. You just have to know more than your targeted audience. I guarantee you know enough about at least one subject to help someone else and build an awesome website. That’s why I wrote this article years ago and I think it’s still relevant today. Don’t sell yourself short. 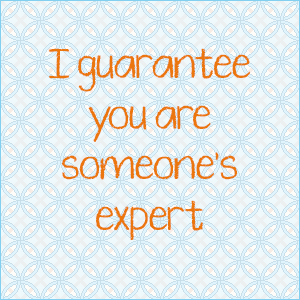 You are an expert to someone. Embrace it and build upon it. I made a video about this and discussed how I almost didn’t launch my Photoshop Course out of fear of no one buying. I hope it inspires you the way it inspired so many of my YouTube subscribers. Subscribe to my channel on YouTube. I’ve never been one to sugarcoat anything so why start now? If building targeted traffic was easy, everyone would be filthy rich in no time. But no, it takes time build up a following. Whoever said build and they will come was clearly not talking about websites because that just isn’t true for most people. One way to make it easier on yourself is to take time developing your own voice and angle so you don’t get lost in the sea of redundant websites and blogs. If you think about people who have success online, I guarantee you can think of one or two things that makes them stand out over other people. That is often a big key to their success and traffic. I’d rather have 100 visits from people who were truly interested in my niche than 1,000 visits from low-quality traffic. For example, Stumbleupon may send you thousands of visitors per day, but if that traffic yields a 96% bounce rate (means only 4% read more than one page) and people stay an average of 10 seconds, that is not quality traffic. Also stay away from those sleazy traffic programs and Fiverr gigs that promise oodles of visitors for cheap. They are banking on you not understanding that low quality traffic is worthless. What’s even worse, the traffic may not even be real. They can simulate it by using bots. The reason these shady services stay alive is people are so focused on quantity, they don’t realize that it’s the quality of traffic that matters more. When I first started blogging I would never write about things I did wrong because I feared people would be disappointed or would no longer find me credible. Ultimately, I had to check myself and realize this was fear of rejection. But I reminded myself that we are all human and no one is perfect. Some of my most commented posts are ones where I talk about things I struggle with. 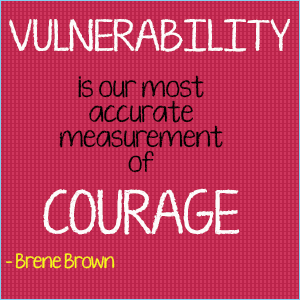 I quickly realized the power of being vulnerable. People want to know your niche-relevant struggles because it reminds them you are human and helps them relate. This is how you build a connection with your followers. As great as AdSense can be for certain sites, let’s face it. Some niches simply outperform others because of ad competition and higher-priced ads. The better the ad competition, the more it drives up the ad cost. That means YOU earn more as a publisher. If you’re in a niche with not as many relevant ads, the ad cost goes down and your potential earnings go down. Some people feel if their AdSense earnings are very low, they are doing something wrong. Sometimes it’s just your niche. Relax, there’s more to the monetizing game than just AdSense. 🙂 You can make money so many different ways: affiliate programs, sponsored posts, 3rd party ads, selling your own products, and AdSense alternatives such as Media.net and Chitika, etc. Listen to my info-packed podcast on understanding and earning more with AdSense. If you are serious about doing this full time, be prepared for fluctuating income. That can be an adjustment if you are used to a set salary. Not only should you have at least 2 years of savings in the bank (YES, TWO! ), but it’s important to develop a lifestyle that allows you to save more than you spend. And please don’t quit your job and rely on your AdSense income alone!! Yikes! Entrepreneurship requires discipline and being smart with your money. If you’re one who likes to spend before you get it, you need to seriously think about adjusting your habits before considering this as a full-time gig. Some people drive themselves nuts trying to find a niche no one has ever tackled. While there are certainly topics that are far more saturated than others, almost every niche worth going after is going to have SOME competition. If there isn’t, you have to ask yourself if it’s worth tackling in the first place. Don’t be afraid of niches with some competition. The key is finding a way to stand out. That’s when you feel like you must join or try every new social site, program or app that comes out. It’s so easy to waste countless hours on sites that are bringing you little value. Trust me! I know from experience. 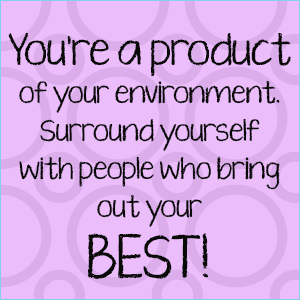 If you want success online, it’s good to surround yourself with people who have what you want. That’s one of the reasons I started my forum in 2007. I wanted people to be able to share their success and help others find their way. Check out the Success Stories sub forum for a dose of inspiration. You can also gain some inspiration from this post I did last year on four successful sites in different niches. Also consider going to relevant events in your city. It’s a great way to meet other like-minded people. I joined MeetUp.com in 2011 and have attended a handful of meetups that are flooded with successful people. When you first try to make money online, it’s logical to follow successful people who have websites on blogging and making money online. But the problem is, some of their tips may not be as relevant for you and your site. Plus, people in the same niche often tend to use and recommend all the same resources and people. So make a habit of seeking out successful people across many different topics. Follow and subscribe to Unmistakable Creative, where Srinivas interviews successful entrepreneurs across all niches. That way you can get ideas from many different kinds of people and sites. So? You setup a site and no one came. You made a YouTube channel and no one is watching but your mom and uncle Henry. You aren’t the first person to experience a setback online. Do you think every site I’ve created has been a success? Noooooo way! The great thing about the Internet is that it’s very forgiving. If you take a misstep you can always adjust and move in another direction. Now that you know it’s more than just “build and they will come”, it’s time to dust yourself off and try again. Are you setting yourself apart from the competition? Re-read Truth #2! Reset and change directions. Don’t be afraid to try something new. My new podcast could end up being a complete waste of time in the long run, but I really enjoy creating the shows and want to see how it pans out. This doesn’t mean you can’t build a successful site without the help of social media and social networks, but it is more challenging today. Lots of people are getting a boost by joining blogging networks like Triberr and actually creating genuine relationships. Not only can it help your site get more exposure, but you’ll build relationships in the process. I know Ileane of Basic Blog Tips is a big fan and John Paul used Triberr to help give his new multi-author blog BrainyMarketer an early boost. By the way, I’m one of the contributors on that new site. Check out my latest article here. 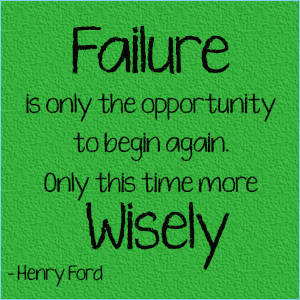 I don’t know a single person online who has had success and didn’t stumble first. 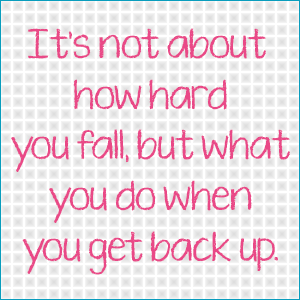 Sure, some stumble harder than others, but everyone takes a misstep now and then. If they told you they didn’t, they’re lying. It’s absolutely impossible to do everything right the first time. It’s not about what you do wrong, but how you handle setbacks. I could write a book outlining everything that’s changed online since I started. Five years ago, no one imagined Facebook limiting their reach to force ad spend, or how much Google’s algorithm would negatively impact some small businesses. If you can’t stomach the ebbs and flows of the Internet, you’re in the wrong industry. Keep your seat belt fastened at all times because the Web will continue to evolve. If you like my advice and want to listen on the go, make sure you check out my podcast. I publish new shows on the 15th of the month. You can listen while in the car, working out, preparing dinner or chillin’ on the beach. 🙂 Listen and subscribe now! Totally agree with you Lisa, I know many people who are earning lots of money on internet without even proper guidance and knowledge. But not everybody is lucky enough and one should have follow the steps of successful persons. Excellent content:) I am now really committed to learning all about clickbank and I am finding your blog not only helpful but also motivating. Are there any clickbank courses that you recommend? Hi Marta, I do pretty well with Clickbank and the reason is I review products I own. I don’t do anything fancy but simply buy it and give specific details about how it works. Yes I love this tips Lisa. I have been a victim of a number of them. Its quite some time since I visited, missed quite a lot. This site helps many of us. I love this article. The best thing is that you give real appreciations. Like saving up for two years ahead and not giving up the job relying on adsense. Bragging about your ideas is something I figured out was wrong doing in another context earlier, I am glad you mentioned that too. Besides talking you into giving up your idea, they can also secretly ‘get inspired’ by it and do something similar! I like the way you define the term “quality content”” because before then I was focus on quality writing. I like your honesty and insight. It’s definitely true that “free can cost you”, as with all things in life, you get you give. Thanks for the many ideas! Wow, that post was full of awesomeness. Thanks one more time Lisa for providing so useful information and guiding people who are just starting with Online businesses. Very interesting post and wonderfully written.. These are some really great truths. What I find really interesting is the constant change of “quality content”. These days, just a regular blog post seems to not be enough. You have to do some in depth posts like Ana Hoffman does or even like Neil Patel does to provide content that’s of the utmost quality. The other thing I completely agree with is that it is tough to do it alone … in fact, no one should TRY to do it along when they first start off blogging. But people (like me when I first started) have these egos and think that they can do it … even though no one else was able to make it and be successful before. Another great post. You make a lot of good points here Lisa. I’m definitely learning which social media sites work for me and which ones don’t. And that’s actually based more on the audience I’m trying to target than my own personal preference. I wouldn’t have any social profiles if it weren’t for my online business. lol…Anyway, everything is not for everyone. The internet is constantly changing. And there isn’t just one path to success, there are many. Thanks for making those point. The 21st truth is the greatest of all, if you choose only one to remember that would be the one, not only constant but inevitable. My personal takeaway: one size NEVER fits all! In the end, you and I have to carve out our own paths in business and in life – the best way to get somewhere is through. Thanks so much, Lisa, for speaking your heart in this post – many of us need to hear it from time to time to keep our perspectives straight. Of course, the mention is always much appreciated; you ROCK! Awwwwww thank you Ana. And I also appreciate you sharing this on social media. Speaking nothing but truths on this article Lisa. I don’t think it hurts folks to learn lessons from those who went before them but at some point we all have to figure out our own way along the path to whatever success means to us. For what it’s worth I like #15 a lot. There are so many new things coming out almost every day and some folks feel compelled to give them all a try. I just don’t have that kind of time and, unless you’re a reviewer, neither does anyone else. A little bit of focus can go a long way. #15 really spoke to me. It took me a LOOOOONG time to stop chasing the shiny objects. Goodness knows how much money and time I wasted chasing my tail, going round in circles and never getting ahead before I finally *focused* and found my stride. I think we all can relate to this at some point in our lives. I know I could as well. The Web and technology has made it so challenging to focus sometimes. So I hear ya!!! Everybody in my life is skeptical of making money online, I did the whole “show them the checks and bank statements”, but they still refuse to believe me. I long ago put it down to sheer jealously because they have to work two or three jobs to make ends meet to feed, clothe and shelter them and their clutch of children. I have been following you for a number of years, loving your posts and amazed at your knowledge, friendliness to all and willingness to share. I have not really commenced the journey yet, although I’ve been on the web and dabbled for years. Too much going on at the moment lol! But I’m of the view, slowly but surely. I’ve learned much a long the way and continue to enjoy learning each and every day. Whenever I feel I’m never going to get there, I receive an email from you with the latest blog entry and I always feel better. So thank you for being so inspiring, not only to myself, but to so many people. You are a true Gem!! Thanks for sharing such rich information with us. i will definitely opt some online business to make some money. You always share Thoughtful information that enlightened us alot. The way u explained this piece is really helpful for me and i am taking it seriously as a part time job to make some money. Yet another inspiring and helpful article that could become an eBook which you can give out for FREE! I was busy pinning those Notes while reading the content. Hi Lisa, I enjoy your interactions with your community of people. I love your straight-up approach and information you share. I wish i had more time to do a full follow-up on all the great information you have provided over the years, but it doesn’t take much to know you are very good at what you do, And i appreciate You. This is an interesting write up, as always, and i wish you the best. Thanks. What a great inspiring awesome post. Such great advice. It’s a small world once you begin to connect the dots. But there are no short cuts to individual success. Yes money making online takes lots of efforts indeed. 1. Yes there is no step guide to success.The rate of success depend on how well you perform on your chosen platform (Might be blogging, YouTube , any CMS site). Surely it does cost you a lot.People use wide range of free platform to start over their business.As you said money might be a issue in this factor. In my case, i have started my first blog at blogger platform for free of cost.It cost me a lot in the long run. Learning from successful stories and people help you a lot.It’s not important to focus successful people in your own niche or industry but you got to widen your range and start leaning from everyone.Make use of wide range of tactics used by everyone to figure your skills. I’ve been on your page following you on a lot of levels you truly are worth following and learning from. Thanks for being such an inspiration enjoy your day . Another surprising thing that happened was the more I would write stuff the better I became at it….. then I started writing on subjects like I was talking to someone in the room with me…anyway this was a long response sorry about that but some of those points took me down memory lane…. Lisa’s site appear to be a little tricky for me replying to your comment addressing her hot topic on “21 Truths About Making Money Online People Never Reveal But Should,” and I’m hoping my reply will reach you appropriately. First of all Will … I would like to thank for being transparent sharing your experience building your Web business. I’m not quite where you guys are [in business] generating traffic or earning revenue, but my hope is to be doing what you’re accomplishing now in your business prior to the end of the year … 2014 – earning some type of income. I find myself in the same boat that you was in [initially] when you started online learning to build an Internet-based business, and for the moment my issue is wanting to ensure that I have all of my “I’s” dotted and my “T’s” are crossed prior to doing any type of marketing online. Your remarks are very real and encouraging in knowing that when I’m finished with building my sites, I am going to do pretty well earning an income through sharing information. Secondly, it’s vital to a business success to have some type of “medium-based” platform such as a website, blog, or social media platform to help establish your authority-ship in your field or market, and there are tons of ways to get that traffic to your site. And last but not least … You’ve done well in expressing your interests in regard to your writing skills, and “keep on keeping on” in doing what it is that you’re doing and you will, no doubt, continue to succeed in business. Thanks for such great information. I went through many article of this topic but really like the way you defined these tips. It would be acting as a valuable tool for me . As for 3 Lisa you learn quickly who to chat with about business and who to keep out in the cold. Some haven’t earned the right to be blessed with your dream; they’ll trample all over it. Stick with chatting to the winners, the uplifters, to make this online money making gig work. Take it from a guy living in Fiji now folks ;), and from Lisa. Dead on advice. Thanks so much Lisa, will tweet this for you. Lisa, as I googled you yesterday, having bitten by Affiliate work as a contingency plan for survival, I have been bobbing up & down for a month, in google search & youtube videos to get the critical mass of knowledge. It has been a confusing and frustrating exercise – too many experts without substance, each probably peddling his half-baked knowledge to generate traffic. Yesterday, I literally stumbled upon one of your videos, and I was hooked instantly. Subscribing to this blog was one of the reactions. I have been copying the youtube URLs of all the videos published by you – there are just too many, and it will take me time to digest everything. One thing is sure, I am done with browsing for “real knowledge” about making a living from online entrepreneurship; it has proved to be a negative learning. I have decided to concentrate only on your posts, podcasts and videos; and restrict the muddying around to only the links provided in contents created by you…if I have to go down; at least I will have the satisfaction of going down with my eyes open. Thanks Lisa, and keep up your good work! I hear ya. There is soooooooooooooo much info out here for newbies and I can imagine how overwhelming it can be when you’re starting. Thanks for indulging the newbees. It did seem overwhelming the deeper I dived, but all pieces are slowly falling in place now that I am focused, exclusively on everything that Lisa Irby has written and continues to write. It is like unlearning a lot of rubbish and re-learning the right way. I am at it 6-8 hours a day, and yet, I don’t think I can start a plan and strategy yet. But, at the least, I am more determined than before. Hey Vagabond….. I thought online cuffing was a new phrase I hadn’t heard of. LOL Thank you. Hi, Lisa. This is a great list….I’m just about getting back up and dusting myself off. You, and all your connections have given me much inspiration. Now, back to WP and fix that boring site and maybe someone will come by. I am trying to help people too, but not with web building. This is not my forte, but as you mentioned, everyone can learn….even a 60+ woman. Lol. I’ve heard of successful bloggers in their 80s believe it or not so you are a spring chicken! lol If you’ve got the desire to learn, you can do it. Just remember to have fun in the process! Thanks for your most valuable information. Great tips for those starting out like myself. Your honesty is refreshing. WOW, great post, What I like the most is there is no step to step guide, sometimes we spend too much time searcing for the holy grail, the only realisitc holy grail is finding what works and finding the rythm of expending sufficient effrots to achieve desired results, everyone in the cyber space has an opinion, some great some just eternally detrimental, ultimately its your own efforts that will reveal to you what can work for you and what will not work. As always this is a great article. My favorite point is “All Traffic is NOT Created Equal”. It is difficult to get that point across to my clients sometimes. Your blog has become a huge resource for me. Thanks for Sharing. Good post Lisa, thanks for sharing. One thing I like about your articles is honesty. You always tell the truth the way it is. That’s why I rely on your advice whenever I read your articles. Appreciate that feedback Mollie. Sometimes the truth isn’t pretty but it needs to be said! You hit the nail right there — Free can cost you more! Recently, I had an argument with someone about free WordPress, I told a fella blogger that I would never, never advise my clients to get free WordPress or free sites like WordPress.com installed. Not only it’s a waste of time transferring it later, both your site and followers to the new domain, but there’s a reason why it’s free. The coding is not as safe and I would never advice my client to go that route knowing that their business is at risk. I heard too many free WordPress being hacked…that sort of thing. Then someone responded to me in that thread that he disagrees with me, and that he’s using free WordPress and that his business is doing fine, tadadada…I told him if you’re telling me about SECURITY and you’re in this free WordPress theme, I would never take you seriously! You are right. Oftentimes, I sell myself short. Thank you for reassurance! I have never thought about this til you said it. I may never be an expert to people like Pat Flynn, but to other beginners I am an expert to them. Take this tutorial video of “How to Make a Simple Video” for instance, I was flabbergasted at the response on this, I never knew some people didn’t even know how to customize their URL on YouTube or simply put books underneath their laptop when talking in front of the camera…when I thought everyone knew about this already! I thought I was making myself pretty redundant about this. Some people are really just thankful to know this. Meetup.com is one of the networking I’m doing offline and I find this much more rewarding than just online per se. Nothing beats face to face! 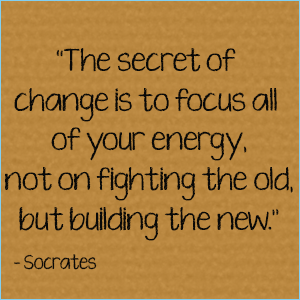 I think the key to change is being ADAPTABLE. Being on the Internet that is absolutely inevitable! Thank you for sharing all your nuggets! I Pocketed this one for later readings, there are tons of valuable links & info in here. Hey Angie, it’s been a while I see you around. trust you’ve been fine. I was just reading all the comments here and sighted your own. Love what you have to say about the free thing and your advice to your clients. I mean that’s the best advice you could ever give to a client trying to kickstart their online business. I started 3yrs ago with a wordpress.com blog and just this year I decided to make it a dot com blog, which I did but trust me it was waste of my time, despite all the 301 redirection I did and spending some extra bucks in order not to lose my SEO juices and all of those huge traffic my site gets. See, I lost everything and I am now back to zero point where I have to grow my blog again from scratch. What a waste! Free things are not worthwhile at all, no wonder the saying goes, “There’s no free things even in Freetown”. Even if there is, it sure will cause you a whole lot. Thank you for that valuable input. I hope somebody read this thread and read your valuable comment, just take it from the experience. Some people are using this free platform of wordpress (wordpress.com) thinking hey, this can’t be beat — third party! but then you don’t even own your content, they do! and if they have a dot com domain, they’d use the free wordpress theme, TOO RISKY TO DO THIS!!!! Hope you have a lovely Wednesday! So Angie! I was just checking this post again to read more comments and see what I can learn and saw your awesome reply. Thanks! Blogging is a mixture of both fun and business and if you’re ever gonna do it, you’ve got to make your intentions right; fun or business? Id it’s the first then you might want to go for using wordpress.com or any free stuffs but if it’s business, you will do well to go for premium tools and I must admit that there are some free stuffs which are good anyways. Many thanks for this comment, Angela. Thanks Lisa I very much appreciate your initiative to help others who are new to blogging and online business. Yep, I put that one in there because people always ask me what they’re doing wrong when a lot of times their niche doesn’t perform well so I wanted to make sure I mention that. Lisa you are always so down to earth and helpful. Learning from you is like a good friend telling what I need to hear and not what I want to hear. Thank you. And you are always so generous with your sharing of my posts. Thanks so much. Fantastic article. It takes a number of years for most people to learn the things that you wrote about in this article. The internet is constantly changing and anyone who does not keep up with what is happening online is going to fall by the wayside. I have created a number of websites on my own since 2002 and I strongly agree with you about not using free websites/web hosting for your business. Speaking of websites, it is very important to have unique content on your website. I certainly appreciate you stopping by. Good luck on your journey. Hope my tips continue to help you along the way. The 21 points you shared here are so awesome and well very valid. There a lot of misconceptions about blogging like people saying that “Blogging is easy” and the likes. Andrienne Smith in one of her great posts wrote about the formal. I love all the points, especially where you talked about “Your Knowledge is More Valuable Than You Think”. That’s a big one for more. Sometimes back, I used to feel inferior and used to believe I have nothing a big deal to share until I started to change my pre-concieved ideas and started believing in myself. Thanks so much Lisa for sharing this 21 truths with us on this massive community. I think successful people intimidate people who are just starting. They feel they have to know more than them but it’s not true. There may be people who value the way YOU teach and there’s always something special you can bring to the table that someone else can’t. That’s the beauty of being an individual. Thank you for sharing! Lisa, these truths should be self-evident but, because they’re not, thanks for consolidating them in one place for those who are in the pursuit of Webby Happiness!